Mail Mail Mail :: I love mail!! A few weeks back I went to my post office expecting nothing in particular and was pleasantly surprised by a delightfully gold wrapped box… I couldn’t wait to get home. I opened it right there. A fellow mail checker also wanted to see what was in this box, so she patiently waited with me. 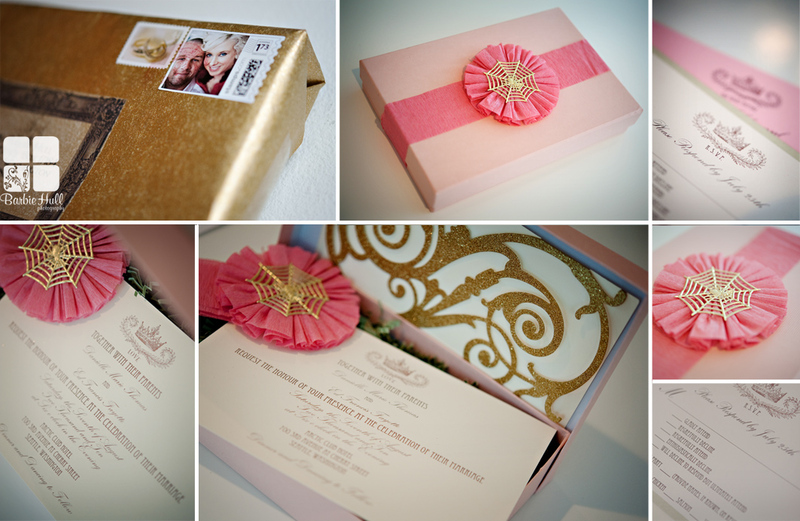 Thank you Danielle & Ed – for many things, one of them being SO awesome to send me an invite to your big day!! Not too long later, I received an invite to the Rehearsal Shmehearsal footy party!! Ed plays for the Seattle Grizzlies! AND this invite had CANDY in it!! RAD!! Danielle is the co-owner of Curtsy Bella, a super fun store near U-Village that is FULL of great ideas, sparkly items, and so many things that you would LOVE. You MUST check it out! !